I return to study the lesson. -Alba: Let’s see … I’ll check again. In the backpack I carry the canteen, the sandwiches, three changes, the wallet with the credit card, the mosquito repellent, the sunscreen, the hydrogen peroxide … I do not know if anything is missing. Oh, I just remembered that I did not buy a toilet bag to carry the toothbrush and the toothpaste. I have made the same mistake again. -Esteban: Well, we do not go to the jungle but you have to carry the basics. You do well being so cautious but it is not necessary to go so loaded. We go to Toledo to spend a weekend, not a year. In any case, we will have a great time! Toledo is an impressive city. You’ll love it. -Alba: Really? I do not know it, but I’m interested in historical cities. Do you think I’ll like architecture? Esteban: Of course. Toledo hosted three different cultures during the Middle Ages: the Christian, the Jewish and the Muslim. Did you know that the three religions coexisted in harmony for some years and today you can see constructions of the three styles perfectly preserved and restored? -Alba: I see that you know very well the history of the city. I did not know so many details. I only know that the Tagus River flows near this city and that it has a very large old town. -Esteban: Indeed! It has a medieval part that is beautiful. By the way, the best thing is that we will not have to pay for any night in a hostel. I just talked to my friend Antonio. Do you know him? -Alba: No, I do not know him. But if he welcomes us into his house, I’m sure he’ll like me very much. Hahaha! Esteban: How smart you are! We will have free accommodation! Huy, I just realized that it’s already eight o’clock. If we do not hurry, we will lose the train. Do you carry the train tickets? Alba and Esteban spent the weekend in Toledo and the city did not disappoint them. They toured the historic city, named a World Heritage Site by UNESCO, and visited castles, monasteries, museums, synagogues of the Jewish quarter and churches. They returned home with a typical Toledo sword. 3 / Grammar is about the Verb Volver in Spanish. I have started to work. In Spanish, both “to know” and “to know” mean “to know”. These verbs are not interchangeable and the one you choose depends on the context. Antonio does not know where the town hall is. Elena does not know this city. To express knowledge or ignorance of a skill, or how to do something, use “know + infinitive”. Miguel knows how to speak Chinese. To say that you know something by heart, use “know”. He knows the multiplication table. 1- Why did Alba and Esteban want to go to Toledo? They wanted to travel to this city to know its great historical heritage. 2- What’s in Alba’s backpack? 3- What have you forgotten to buy Alba? He has not bought a toilet bag to carry the toothbrush and the toothpaste. 4- What does Esteban think about everything Alba has? Think that Alba does well being so cautious but it is not necessary to go so loaded. 5- What cultures coexisted in Toledo in the Middle Ages? The Christian, the Jewish and the Muslim. 6- What buildings can be seen in the city? You can see constructions of the three styles perfectly preserved and restored. 7- Why are not they going to pay for a hostel? Because Antonio is going to welcome you in his house. 8- What does Esteban realize? That it is already 8 o’clock and if they do not hurry, they will lose the train. 9- What are the two friends doing in Toledo? Stroll through the historic city, named a World Heritage Site by UNESCO, and visit castles, monasteries, museums, Jewish neighborhood synagogues and churches. 10- What memory do you take home? They returned home with a typical Toledo sword. 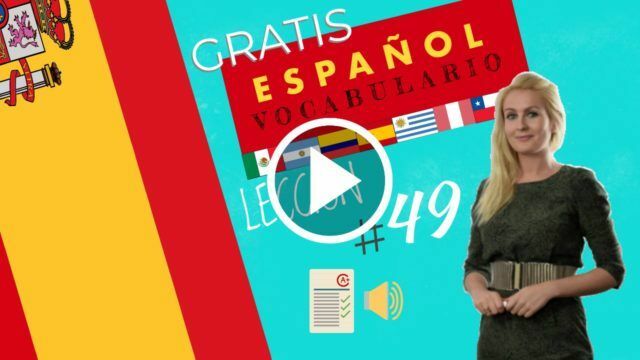 How to use the Verb Volver in Spanish?